It’s Monday and we’ve got another SummerSlam event in the books! Despite the show being really really long, I enjoyed it overall. Here’s a few thoughts on some specific matches. Reading through feedback from the show last night I think it’s safe to say many weren’t fans of the finish in this match. I didn’t have a big problem with it personally. I like an increased sense of realism in this particular match and I like the fact that this approach is normally taken when it involves Lesnar. I think when you’ve got someone in his situation being a wrestler and a MMA fighter there should be a difference to the way he’s presented. I also think that you can invite more senses of realism into WWE storylines overall and it may help to welcome people to finishes like this. Right now people aren’t used to it and thus may reject it. As for the aftermath with Shane coming down and getting destroyed and this image of the show ending with Brock going to the back and leaving Orton and Shane down and out in the ring left me with more questions then answers. This is usual for WWE where often we get a PPV ending which seems more to make you watch the TV programming instead of the TV programming enticing you to watch the PPV for a climax to a story or a satisfying development at the end. I would say it’s a simple as Stephanie and Mick calling Lesnar out and forcing a suspension of some kind but given the brand rivalry and Stephanie’s dislike for her brother if you follow that closely they should call him out and throw him a party! He took out 2 big players from Smackdown. I am interested to see which direction they go tonight on RAW. I was looking forward to this match since it was announced and boy did it deliver. These 2 work very well together in the ring and I really enjoyed it. I didn’t care for the crowd during the match crapping on the new belt that was revealed before the match started. The crowd pays their money and they can chant as they please but I think they should have had more respect for the talent. Perfectly ok if you want to boo while they unveil the belt though. As for me, I don’t have a big problem with the belt as others do. In the past when we’ve heard about a new belt there has always been a long history of fun in speculating what the belt will look like. WWE opted to keep the belts image matching the current WWE title as well as the Women’s championship and that seems to be met with some resistance. Some say it’s because of the color and other say the design not being changed up. Personally and I know people will disagree but I like that this belt matches the other ones. I am a fan of how UFC presents their belts and the fact that WWE is gonna have their top 3 belts keep the same design, I think it’s a good move. Go ahead and trash me on Twitter if you want. Back to the match. 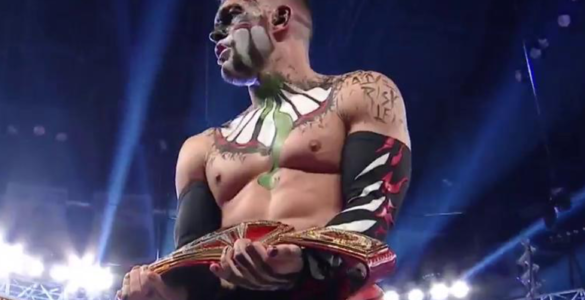 I thought that if Finn was going to bring the Demon or Demon King (as WWE is calling it on the main roster) to SummerSlam that he should win. There is a history of Finn in NXT bring the Demon for big matches and winning said matches. That said, I realize he isn’t going to win each and every match at the Demon but at this point with his debut night still fresh in our minds I don’t think it would have been a good idea to bring him in and have him lose the big ones. Seth is not going to lose anything here. He will be champion again without question and I think we will have a nice feud between the two for the next show or two until they get Roman back up to the title scene at which point whomever is champion by then will likely drop to him. I hope Finn gets a decent title reign and isn’t held back with his body type. I hope that they go all in with him here. I thought this was the match of the night. When you think of excellent SummerSlam matches in history, this one will certainly fit in nice with anyone’s list. AJ Styles made a great case as to why he should be at the top of the brand he’s on (in this case Smackdown) and Cena adds another classic to his resume of big time performances. I am interested to see what happens with Cena next given his post match gesture of leaving his Never Give Up armband in the middle of the ring and walking away. When I say what happens next, I am speaking about the storyline explanation if any while he goes off to film the 2nd season of his Fox show. As for Styles, if it were up to me I would have him cut a promo on Smackdown this week and talk about how now that he’s beat the “Face that runs the place” he has earned himself a title shot. From there I think he should go on to win the WWE title and the Smackdown brand is built around him. Following this match I think it is time to take the WWE title in a new direction with Styles. The match wasn’t terrible but it also didn’t blow me or I think anyone for that matter away. I wasn’t convinced in this latest effort that Ziggler is ready to be a world champion. He can only be the “show stopper” who wants to “steal the show” for so long. I don’t feel like beyond some decent promo exchanges with Ambrose that he is the right choice. I think the ship has sailed. It’s not 2013 anymore and they have done a lot of damage to him over these last few years. Ambrose is a fine champion and perhaps if they don’t go right to Styles they could pair him with someone else and we could possibly see why he should continue as champion but right now I think the path is obvious. Ambrose enters a feud with Styles and you shouldn’t have Styles lose with all the momentum he has. Ziggler can enter in a feud with Bray Wyatt who also needs something going forward and they started something a few weeks back. The rest of the show was decent. I like the pairing of Jericho and Owens despite my own personal preference of having Owens as a top singles star. I don’t like Crews losing here to Miz who hasn’t really been presented as a strong champion. There is a ton of speculation about Sasha Banks going around online following a quick title run. I don’t know what the real story is but I hope that whatever it is she will be back soon and ready to get the title back. She is a great talent. This now leaves a spot open for Bayley and perhaps they can bring her up and feud with Charlotte. I am not saying she needs to win the title right now but I think she will be a good fresh option for Charlotte. I was wondering why WWE gave us a finish to the Reigns/Rusev match on RAW last week, after last night I now know they weren’t planning to give us a real match. It’s not a complete negative as the spot they were in they probably weren’t going to get a good reaction from the crowd so they just had Reigns destroy Rusev and never let the match really get started. Hopefully Rusev can get some revenge on RAW tonight and this won’t be such a one sided program. I was hoping the Club could get a big win here and really get them going but that wasn’t the story to tell on this night. They lost to the New Day who are still doing the same humor week in/week out. I am hoping they will change it up a bit going forward. Thanks for reading! Leave your comments below on if you agree/disagree on my thoughts and feel free to add your own!